I read this article and found it very interesting, thought it might be something for you. 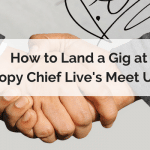 The article is called How to Land a Gig at Copy Chief Live’s Meet Ups and is located at https://copychief.com/meet-ups-copy-chief-live/. Networking at a live event can be challenging. There’s a lot going on. And it can seem overwhelming… even daunting… to get a chance to talk to someone important. Especially if it’s someone who can give you a gig. Last year, it was my pleasure to run the Roundtable Meetups at Copy Chief Live. And this year, I’m excited to do it again. I want to give you a little insider insight on how the Meetups are run, so you can relax and make the most of your networking time. I’ll admit that the first time I heard that phrase, I thought they were shining me on… or just being polite. But this past year, I personally wrote for a publisher. And you know what I learned? They really DO need new writers, all the time. We’re all different writers, with different life experiences. We can read the same marketing books, and use the same headline and hook formulas, but still… your work will turn out completely different from mine, because your life experience is different from mine. You might look at the same pile of research material and see something different. You might organize your ideas different. Tell a different story. Or decide my approach is a complete mess and start completely over from a new direction. That’s why copywriting will never be taken over by computers or apps. And that’s why it’s ESSENTIAL that you step up and take your place in this wacky world of copywriting. Most people don’t know this but I used to have severe social anxiety. It was so bad, that I wasn’t able to attend marketing conferences without a family member. The sheer number of people was too much for me, so here’s what I did: My family member would walk into the room ahead of me. I’d fix my eyes on him. And I’d walk directly to him, and sit down, without looking at anyone else around me. It was awkward, but it worked. On the outside, it looked like I was a huge personality who owned the room. But the the reality was, I was terrified. The biggest thing that helped me overcome my social anxiety was letting people know that I could use a little extra support. For example, “Can you tell me what to expect when I walk into the room? What will I see? A coffee pot? Tables? Will I need a sweater? How many people will be there?” Any little detail helped me feel more comfortable so I could relax and do what I went there to do… meet people! There will be representatives from several publishers, AND there will be independent business owners. The room will be set up as a set of round tables. The tables will seat about 8 people. This means, that you’ll be able to comfortably sit down with the person who can hire you, and grill him/her about their business. Each Meetup will be 15 minutes long. I’ve asked the publishers and biz owners to use a specific presentation format to help you get the most useful info in the least amount of time. They’ll start by talking about their business and what they need. Then, they’ll answer some frequently asked questions. Then, they’ll open the floor for your questions. If you have written a short sample sales letter for Copy Chief Live, please bring it. This is a good time to get it into the hands of someone who can hire you. Before the event, think of 1 or 2 questions you’d like to ask the publisher or biz owner. They don’t have to be flashy questions. But it’s always nice to have something to talk about… especially when it’s something that you’re genuinely interested in. A good question to ask is: “What’s important to you about __?” You’ll be amazed what people will answer. It’s not always about getting more sales (although it might be). Sometimes, it’s about finding someone who’s fun and eager to learn. Sometimes, it’s about finding fresh ideas. Sometimes, it’s about needing someone who can streamline an existing process. You won’t know until you ask. I will be in the room the entire time. If you need some quick advice on who to meet, or when it’s a good time to duck out for a coffee refill, I’m here for you. I’ve also been known to grab people in the hallway who have compatible goals, to make sure you have the easiest time connecting with the right people. In case you can’t tell, I’m very excited to see you at Copy Chief Live. I look forward to this event all year. If you need help or advice before the event, you can comment below. My favorite story from Copy Chief Live 2017 is from Tanja Pislar. She said, “Here’s my success story in one sentence: I came to CCL2017 a rookie and broke, and I left still a rookie… but with a contract.” (There are a lot of success stories inside of the Copy Chief community, too). Great advice — love the idea of bringing along something prepared, how impressive would that be to the client prospects?